The Wii U event in New York City finally unveiled the release date for Nintendo’s upcoming console in the US. If you can’t want for the Xbox 720 and the Playstation 4 and want next-gen gaming now, then read on! 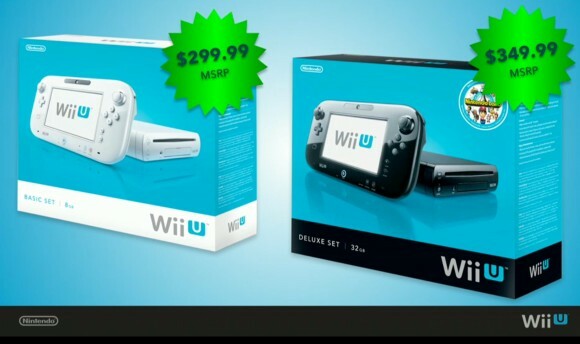 According to IGN‘s report on the event, the Wii U will hit US shelves in about on November 18. As was revealed in the Wii U Japan event, there will be two variants available — a basic set and a deluxe set. The Basic Set will come with a Wii U console with 8 GB of flash memory, a Wii U GamePad, an HDMI cable , an adapter and a Wii U sensor bar. It will be available in white and will retail for for $299.99. The Deluxe Set on the other hand will come with a black Wii U console with 32 GB of flash memory and everything that comes with the Basic Set. People who purchase the Deluxe Set will also be getting a GamePad charging cradle, two GamePad stands and a copy of the game Nintendo Land. The Deluxe Set will set you back by $349.99. For our friends over in Europe, the Wii U will be available on November 30. Will you be getting a Wii U on launch day? Or will you be saving your money for the Xbox 720 and Playstation 4 launch?